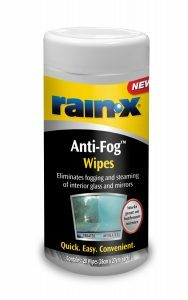 Rain-X Anti-Fog is designed to eliminate interior condensation caused by wet weather, high humidity levels or temperature changes. The new and improved formula provides increased anti-fogging protection, and even works well under high humidity conditions. This makes it ideal to reduce condensation forming on interior automotive glass, such as windows and mirrors, especially on those cold, damp days. It is also suitable for use on bathroom mirrors to eliminate steaming! On first use, unscrew top and feed wipe through dispenser. Pull wipe through and tear along perforations. 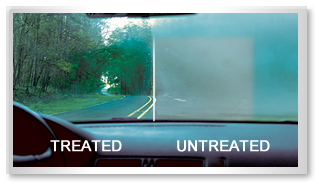 Apply Rain-X Anti-Fog treatment wipe to interior glass surface using firm, circular overlapping motions to ensure whole screen is treated. Buff out haze with a dry cloth or paper towel. DO NOT DRIVE UNTIL WINDSCREEN IS COMPLETELY CLEAR. When finished, ensure top is secured for transporting and to retain moisture. Ensure surface is fully clean before application.